Who doesn’t love a cuddly little kitty cat? They are cute when they play but sometimes their playful actions aren’t so cute. Often they rip up your drapes and furnishings with their claws. The best option is to get a cat tree. But there are so many sizes and types out there. This article will review a few varieties and examine their benefits. Some cat owners will have their cats declawed in order to save their furniture from ultimate destruction. The Humane Society warns that declawing a cat is cruel and should only be done if there is a life-threatening concern such as a cancerous tumor. They state that if performed on a human being, declawing would be like cutting off each finger at the last knuckle. Scratching is a natural feline behavior. The best solution is to train your cat to sharpen his claws on a cat tree. If your cat is very active (such as Siamese, Abyssinian or other active breed of cat) and climbs onto high places like bookcases, ledges or on top of your refrigerator, you will want to get a multi-level tall cat tree to appease the desire to climb while providing an outlet for him to sharpen his claws. Most cat trees are fully carpeted in neutral tones that will fit the interior of any room. Some also come with cat condos that provide great hiding places. Cats love to climb and hide so getting one with a condo might be an excellent choice. A good place to put the tree is by a window. If you hang a hummingbird feeder outside the window the cat will be captivated for hours. However, these tall trees are best suited for younger and middle-aged cats. These are excellent options for older cats that have slowed down and don’t climb or play like they used to. You can get a 24 -inch tree with a cat condo to provide kitty with a hiding place that he doesn’t need to jump up to. Some even have attachable hammocks for napping. These trees sit on the ground to accommodate cats with arthritis or other conditions that come with old age that hinder high jumping. Having a big bulky cat tree can pose as a major interior blemish in your carefully designed room. However, there are some tall yet low profile trees that won’t stand out like a sore thumb. You can even have the three’s carpet dyed to match your interior to further blend in the cat’s little playground. 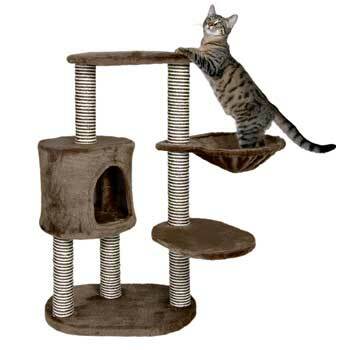 Some cat trees are equipped with built-in toys and ramps that provide kitty with more activities. Unless your cat is older and has ceased playing, buying a cat tree with built-in toys would be a nice bonus for your favorite feline. After you determine what kind of a cat tree your kitty needs, be sure to do some online research and see what other cat owners have bought. Pay attention to product reviews on multiple sites in order to gauge what products your cat might love the most. Many product review sites link out to Petco or Petsmart, as well as other retailers that supply cat trees and any other item you could possibly want for your pet. These review sites will help you make smart purchasing decisions that will leave your cat purring.